With the understanding that we are what we eat, Hinterland Chiropractic has dedicated chiropractors that offer professional Nutritional Advice In Gold Coast. Just recently, a team of Harvard researchers published a report that focuses on both weight gain and weight loss in the New England Journal of Medicine. The report confirms that although lifestyle behaviours such as physical activity and sleep duration dictate how much weight we gain or lose overtime, it is still our eating habits that matters most. Here, Nutritional Advice In Gold Coast shares with you 5 foods that effectively drive weight loss. These foods do so by boosting your body’s natural ability to burn calories while curbing your cravings at the same time. See how lean beef, buckwheat pasta, pomegranates, olive oil and cinnamon can help you with your goals. There is absolutely no reason to fear beef. In fact, you should be serving lean beef if you are trying to shed off the excess weight. Lean beef is a rich source of the amino acid leucine which naturally boosts the calorie burning ability of the muscles. According to a study conducted at The University of Illinois, consuming up to 10 ounces of beef on a 1,700 calorie diet generally helps people lose fat while retaining muscle mass. Beef eaters are noted to have fewer hunger pangs that those who are not. If you love pasta but don’t want to load up on carbs, then it’s high time you consider using buckwheat pasta instead of regular noodles. 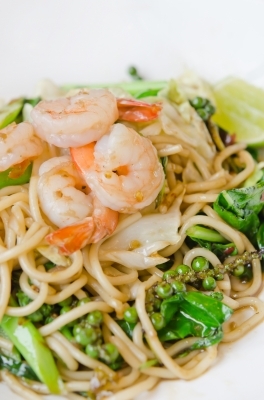 As compared to the regular stuff, buckwheat pasta has high fiber content. More importantly, buckwheat pasta comes with protein which makes it more difficult to overeat compared to regular noodles. It is no secret how pomegranate juice is practically regarded as a fountain good health. The less known pomegranate seed help foster good health too. Pomegranate seeds are loaded with folate and adequate amounts of disease fighting antioxidants. Apart from this, pomegranate seeds have low calorie and high fiber content making them the perfect diet friendly-treat that satisfies your too sweet tooth. What most people don’t know is that extra virgin olive oil actually helps enhance the natural fat burning process of the body. In a related Australian study, 12 female subjects were given breakfast cereal prepared with 2 different mixtures. One mix consists of skim milk and cream while another consist of skim milk and olive oil. Women who ate the cereal prepared with olive oil and skim milk experience a significant boost in their metabolism. Olive oil doesn’t only work as an oatmeal mix, olive oil also works as salad dressing, bread dip, and cooking oil. Cinnamon sprinkles over oatmeal or whole grain toast does a fantastic job in relieving mid-afternoon sugar slumps. Related research conducted by the US Department of Agriculture suggests that a little cinnamon helps keep post-meal insulin spike under control. Moreover, a quarter teaspoon of cinnamon daily efficiently lowers cholesterol and triglyceride levels which are linked with type 2 diabetes. It is always healthy to have eating habits that keep your weight under control. The idea of proper nutrition, however, is a far more complex and comprehensive subject. For this, Hinterland Chiropractic offers professional Nutritional Advice In Gold Coast. Hinterland Chiropractic has expert chiropractors that dedicate their time and expertise in helping you achieve good health through proper food choices. Moreover, when you make your first appointment with Hinterland Chiropractic today, you get $240 worth of chiropractic care for only $65. This includes full spinal and postural examination, bilateral weight scale analysis, computerized spinal scan, and a comprehensive report of relevant findings. Contact us today to claim this special offer.